DoCoMo's attempts to exit India has just got a bit more bumpier with the Tata group offering to buy out Japanese telecom giant's stake in Tata Teleservices at Rs 23.34 per share, more than 50 percent lower than earlier offer of Rs 58. According to an exclusive report in The Business Standard, the Tata group has made this offer valuing the company at just Rs 11,000 crore. Docomo had invested in Tata Teleservices at Rs 117 per share valuation. The Tata group's move comes after the RBI rejected its earlier proposal to buy DoCoMo's stake in the struggling joint venture for about Rs 7,250 crore or Rs 58 a share. The latest offer, which is 60 percent lower than the earlier offer, is based on a fair value arrived at by PriceWaterhousecooper. The yen's 30 percent depreciation is adding more trouble to the company, says the BS report. What this means is that the value of of DoCoMo's original investment in Tata Teleservices would see a 90 percent erosion. DoCoMo has moved the London Court of Arbitration to get a valuation of Rs 58 per share. Tata Sons had in November 2014 applied the RBI to purchase DoCoMo's 26.5 per cent stake at Rs 58.045 per share (totalling about Rs 7,250 crore) - half the price which the Japanese firm paid in 2009. DoCoMo had invested $2.2 billion in Tata Teleservices. The joint venture agreement had a clause that promised DoCoMo at least 50 percent of the value of its original investment if it decided to exit in five years. The Japanese company had also agreed to increase its investment subject to certain performance milestones of Tata Teleservices. 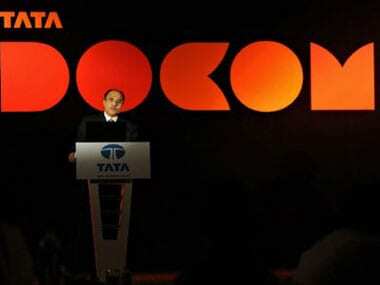 The Tata group company has, however, failed to meet the milestones, and has been making losses. That is the reason for DoCoMo's decision to exit the venture. Tata Sons had engaged PwC to determine the fair value in relation to the equity shares of Tata Teleservices Ltd. As per their report, the fair value was Rs 23.34 per share. Unable to find a buyer for DoCoMo's stake, Tata Sons in November applied to the RBI to purchase the stake at Rs 58.045 per share - half the price DoCoMo had paid in 2009. But it could not get the requisite approvals in time and DoCoMo earlier this month dragged Tatas to an international court of arbitration. The Japanese firm had stated that as per the 2009 agreement that formed Tata Teleservices, DoCoMo can sell the shares if the joint venture fails to meet performance targets in the fiscal year that ended on March 31 last year. DoCoMo, TTSL and Tata Sons had in March 2009 signed shareholder agreement for the business alliance. DoCoMo picked up 27.31 per cent stake in Tata Teleservices for Rs 12,924 crore and 20.25 per cent in Tata Teleservices (Maharashtra) Ltd - the listed arm of TTSL - for Rs 949 crore. Overall, DoCoMo holds 26.5 per cent in Tata Teleservices.